When I started this whole drone business, I imagined by now I’d be a fairly proficient – albeit amateur – drone pilot. But, not so. I ordered two drones on April 6th and they arrived not long after. At the time, I thought that was good service from online seller Banggood. But, in my last Drone Diaries article I mentioned the fact the Cheerson CX-35 – the drone I really wanted to use – had problems. I filed a complaint with the seller at the beginning of May. To date, there’s been no response. The website shows my complaint as “Processing.” Take your time, eh. So, I hunted around on the Banggood website and noticed at the bottom of the main screen it says “Customer Service / Contact Us.” So I did. About ten days ago. Since then, not much has happened, but at least something has. That’s more than can be said for the seller, which I’m guessing is not Banggood but a supplier tucked away somewhere in deepest darkest China. Banggood was very sorry, and asked nicely, “Please can you send a video to show us the problem?” So I thought, how do you make a video of something that doesn’t work? 5 seconds: Here’s the drone not working. 1 minute: Here’s the drone still not working. 5 minutes: No fairy has waved a magic wand, so it’s still not working. So I sent a photo of the drone not working. A few days later they asked if I’d tried another battery. So I politely explained that if I had another battery, for sure I would have tried it. And then, almost as politely, pointed out I’d attempted to buy spare batteries from Banggood, but they’d said “Cannot ship to your location.” As it happens, I have ordered spares from somewhere else but they haven’t arrived yet. There was no comment on this. But they did ask again “Can you send us a video?” Does everyone have to make a video? What do they do with all these videos of their products not working? The mind boggles. Well, mine does. I figured I had no choice. I sent them a video. That seems to have silenced them, which of course is not a GoodThing, as now I have no idea what is happening. See? 53% discount. That’s a good offer. Except when you look closely you discover you can’t place an order because the seller has no stock. Isn’t that fraudulent advertising? Offering something at a price at which you can’t sell. Already in the last two days the price has gone up, but they still have no stock. Will they sell to me at that low price when they do have stock? I’ve asked. No reply. Have they stopped replying to my messages because their supplier has no stock, and so they couldn’t replace my faulty drone even if they wanted to? Food for thought. All of which leaves me in Limbo – a sub-district of Khanom, where I live! Will I ever escape? Well; I’m going to wait until the end of business on Monday to decide what to do next. Most likely I’ll be ordering another Cheerson CX-35 from another supplier. Why buy another of something that’s given me problems? Well, when it did fly, I enjoyed it. And now I have lots of spares. Maybe at some point Banggood might even replace the dead one. Stay tuned on that. So for now, I’m drone-less. Eh? You bought two drones. Why don’t you tell them what happened to the tiny Eachine E-50? After some miserable attempts at flying the thing, which I explained in this article, I pretty-much had to strip it down, to laboriously remove bits of grit and gravel from the engine housings, and replace a couple of spindles and blades. So yes, I did head out yesterday, because I really wanted to fly. I powered-up the motors, it took off to a height of about two meters, and then took off – down the field. This is the drone that needs an iPad (or similar) as the controller. So I tapped the Land button. Nothing. So I tapped the Off button. Still nothing. That should have caused the thing to crash land. It just kept disappearing into the distance, until I lost sight of it. I had a half-hearted attempt at finding it, without success. What was I going to do with it if I did find it? Have it stuffed and mounted on the wall? Useless thing. Anything that needs a screen to control it, whether iPad or otherwise, is impractical. In sunlight you can’t see the screen. There’s no tactile feedback from the controls, which makes it difficult to know what controls you are moving. You need to look at the iPad to figure what you need to tap next, and you can’t look at the screen and the drone at the same time. Which is why drones get lost! They are far too light weight. Even the slightest puff of a breeze will send the thing off in the wrong direction. The tiny ones have no prop guards, so, as I discovered, lots of spare blades and axles/spindles are needed. So, there’ll be no more mention of the Eachine E-50. It’s a late drone. 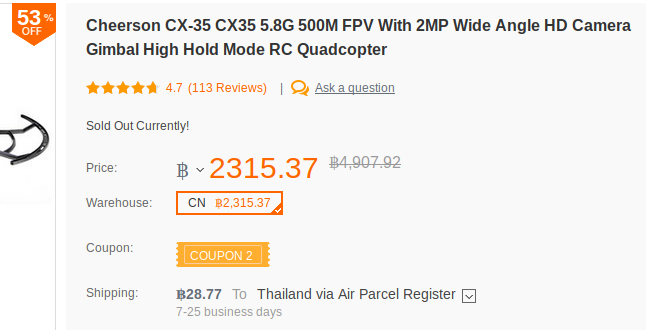 I’ll just have to wait, not very patiently, for another Cheerson CX-35 to arrive from somewhere, and then maybe, just maybe, I can get flying again.